After a rough start to the season, the New Mexico State football team is finally in the win column. The Aggies defeated the UTEP Miners on Saturday, Sept. 22, at the Sun Bowl Stadium in El Paso. The Miners got the ball to start the game and were held to a three-and-out on the opening drive. The Aggies sent a full out punt block and successfully blocked the punt. Junior wide receiver, Izaiah Lottie, scooped up the blocked punt and returned it for a touchdown to give the Aggies an early 7-0 advantage. UTEP was able to tie the game at seven on its next possession when the Miners drove the ball 75 yards and eventually scored on a one-yard touchdown run. After a field goal gave them the lead with around five minutes left in the quarter, the Aggies finished the first quarter ahead, 10-7. The Miners were able to convert a field goal midway through the second quarter that evened the game up at 10. It looked as though the game was going to be tied going into the half, but late in the second quarter the Aggies were able to get pressure and junior defensive linemen, Cedric Wilcots, sacked the UTEP quarterback, causing him to fumble. Senior defensive back, Malik Demby, scooped up the ball and returned it 55 yards to give the Aggies the advantage going into the break, 17-10. The Aggies could not get anything going on their opening drive of the second half and were forced to punt the ball to the Miners. UTEP didn’t waste much time finding the end zone after a 76-yard touchdown pass tied the game at 17. After a missed field goal by the Miners, the Aggies were looking to gain the lead back on their next drive. Freshmen quarterback, Josh Adkins, found senior running back Royce Caldwell open for a short completion. Caldwell was able to shake off the first UTEP defender as he turned on the speed and raced to the end zone for a 53-yard touchdown score. This put the Aggies ahead 24-17 going into the fourth quarter. 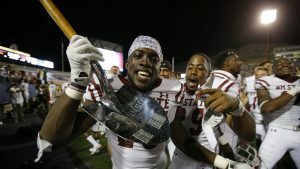 After a couple of field goals by each team during the fourth quarter, the Aggies were able to celebrate a 27-20 victory. This was the first win for the Aggies in the 2018 season and they are hoping to follow it up with another. The Aggies have a bye this upcoming weekend and will next host Liberty on Saturday, Oct. 6, inside Aggie Memorial Stadium.